Home » Conventions and Events » Destination Star Trek » Credit Cards on Standby for Destination Star Trek – On Sale Next Week! Here we go again! The best way to get over the post con blues is to start planning your next event. It’s like Q was watching, snapped his fingers and landed this on our social media channels. 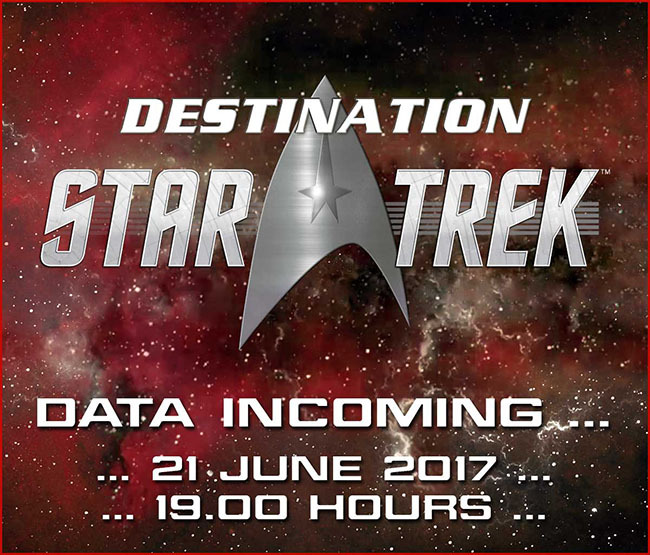 It’s Destination Star Trek doing what Destination Star Trek does best, announce announcements! Remember, we’re simple tailors…umm Trekkie Girls so we don’t have any behind the scenes information to give you. But we do like to guess! There’s no clue as to when this will be held. The last DST’s have been held in October or February. Could there be one this October!? Or maybe next February? Give us some time to save please! They state “all will be revealed” – we presume this means location and possibly initial guest list? Maybe a preemptive cancellation apology from Jonathan Frakes!? Previous locations have included the London ExCel, Birmingham NEC and Frankfurt. We also wondered if “Data incoming” was a clue? Brent Spiner perhaps?? This year we have the TNG 30th Anniversary but 2018 has much to celebrate with the 25th Anniversary of DS9 and we’ll be into the second season of Star Trek Discovery. Hopefully this will be bring an influx of fans into our crazy Trekkie club, looking to experience their first Star Trek Convention.